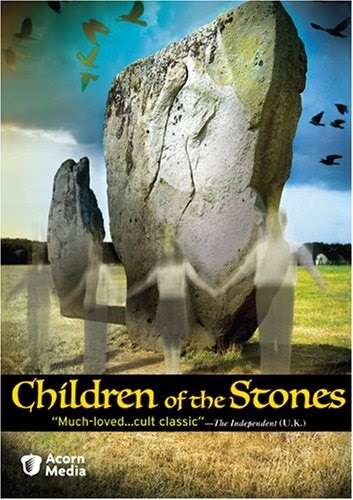 "Children of the Stones" (1977) starring Gareth Thomas, Veronica Strong, Peter Demin, Ruth Dunning, Iain Cuthbertson and Katharine Levy is a British serial that takes place in a sinister village and is geared toward children but fun to watch at all ages. Scientist Adam Brake (Thomas) and his son Matthew (Demin) are moving to the sleepy English village of Milbury for three months to do some research on the magnetic forces surrounding the local stone formations that circle the village. They soon meet Margaret (Strong) and her daughter Sandra (Levy) who also have recently moved to town and start telling them about the weirdness going on in the village. Milbury is full of happy people. They say "Happy Day" to each other instead of good afternoon and everything is always well. They also like to go to the stone circle, hold hands and chant every once in a while in the middle of the night. What are they all up to? Well, our group of adults and children work together and try to solve the mystery before it's too late because, you see, all the newcomers eventually turn into a "Happy Dayer". Not only that, but Matthew and his father are somewhat receptive to the psychic energies and visions coming off the stones. "Children of the Stones" is a world where the children are smart and the parents actually listen to them. The village is full of strange characters that just want our characters to be part of the town and join with them and mysteries galore. A very fun adventure/mystery show with a sinister atmosphere throughout! What an amazing movie it was! I still remember when I first saw Children of the Stone. I was 10 years old. You blog is really entertaining. Keep posting!